VoIP is short for Voice over Internet Protocol. Voice over Internet Protocol is a category of hardware and software that enables people to use the Internet as the transmission medium for telephone calls by sending voice data in packets using IP rather than by traditional circuit transmissions of the Public Switched Telephone Network which refers to the international telephone system based on copper wires carrying analog voice data. The data is sent digitally, using the Internet Protocol (IP) instead of analog telephone lines. This allows people to talk to one another long-distance and around the world without having to pay long distance or international phone charges. Many VoIP programs allow you to use a basic microphone and speaker setup. Others require VoIP phones, which are like regular telephone handsets, but typically connect to your computer via USB. Analog telephone adapters allow you to use regular phones with your computer. IP phones are another option that connects directly to a router via Ethernet or wirelessly. These phones have all the necessary software for VoIP built in and therefore do not require a computer. VoIP uses codecs to encapsulate audio into data packets, transmit the packets across an IP network and unencapsulated the packets back into audio at the other end of the connection. By eliminating the use of circuit-switched networks for voice, VoIP reduces network infrastructure costs, enables providers to deliver voice services over their broadband and private networks and allows enterprises to operate a single voice and data network. VoIP also piggy-backs on the resiliency of IP-based networks by enabling fast failover around outages and redundant communications between endpoints and networks. Voice over LTE is commonly referred to as VoLTE and stands for Voice over Long Term Evolution. Voice over LTE is very similar to Voice over IP (VoIP) where an application such as Skype is used by cellular carriers to support telephone calls using a broadband Internet connection. Voice over LTE is supported by a similar app that allows data to travel over the Internet. LTE is being looked at as the next generation of communications since the protocol is capable of providing faster and higher quality voice calls. Additionally, it adds video chat to your cellular plan and your phone number. LTE provides a wide array of improvements versus previous network standards. LTE is an all-IP based network standard, so if it does not natively support the antiquated circuit switched protocol. VoLTE uses the IP Multimedia Core Network Subsystem (IMS) architectural framework. IMS allows for ubiquitous multimedia access using a common IP interface. This greatly simplifies network management and provides better developer accessibility. With the IMS framework, VoLTE is able to interoperate with circuit switched voice networks without having any dependency on or requirement for them. Additionally, the common IP interface of IMS will allow VoLTE to interoperate with other voice networking technologies even after legacy circuit-switched networks are finally phased out. While engaged in a voice call, a user might pass outside of an LTE coverage area, so that call needs to be able to fall back onto legacy networks. The VoLTE standard accomplishes this with Single Radio Voice Call Continuity (SRVCC). With SRVCC, when an LTE tower determines that a user might leave the coverage area during an active connection, it leverages the IMS framework to initiate a second connection over the legacy standards. Both connections are maintained until the LTE signal is lost, the LTE tower determines the user will not leave the coverage area, or the voice call ends. 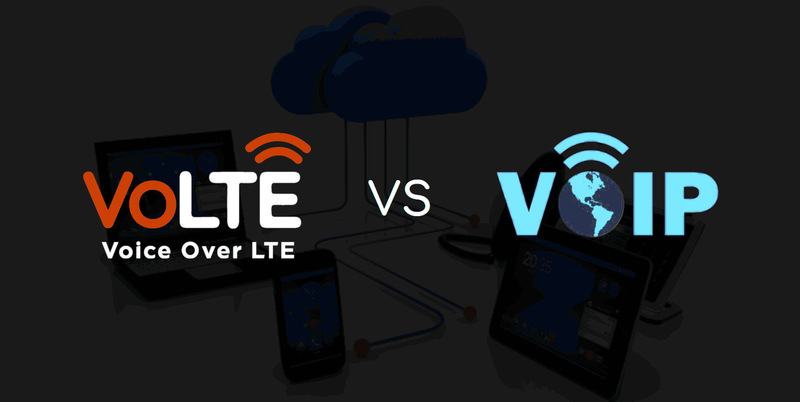 What are the differences between VoLTE and VoIP? VoLTE is delivered through an LTE network, encapsulating all voice communication over IP and then sending it over an LTE WAN. This carrier-controlled setup, typically deployed via phones as endpoints, provides excellent Quality of Service (QoS). On the other hand, VoIP differs in that it is carrier independent. Rather than running through an LTE network only, VoIP will run over any IP network. For examples, many enterprises run VoIP by using LTE through a Cradlepoint router - utilizing either the Internet or their company’s Intranet. Over a congested or loaded VoLTE network, call quality has been rated higher than other web applications. The advantage of VoIP is that the telephone calls over the Internet do not incur a surcharge beyond what the user is paying for Internet access, much in the same way that the user doesn't pay for sending individual emails over the Internet. You can make and receive video calls from anyone else with VoLTE, rather than relying on separate accounts. In VoIP, Internet delivery is done on a “best effort” basis; all you can do is get your packets to the cloud and cross your fingers. VoLTE, on the other hand, uses the IP Multimedia Subsystem (IMS) and new radio access network features to ensure low latency, improved error correction in fringe areas, and other features that guarantee voice service as good as or better than any we’ve ever experienced. VoIP sends the packets (the actual voice digitized to data) over the Internet from the sender to the receiver. The packet is treated like any other type of data packets, such as web traffic or video streaming, when sent over the public Internet. But the voice packet doesn’t have any special priority over any other packet, which can affect the quality of the call. In contrast, in a VoLTE network, packets are given special priority. They have a quality of service capability built into them that results in much higher-quality phone calls.